Monday night, Warren Beatty receives the Hollywood Foreign Press Association’s Cecil B. DeMille Award at NBC’s Golden Globes show. 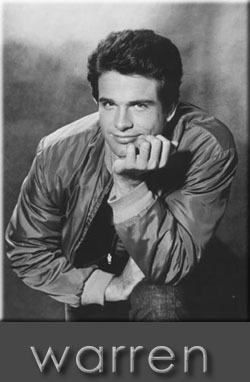 So I thought I’d share with you my absolute favorite Warren Beatty story, which has never been published: It was the beginning of his acting career, and those were the days when showbiz veterans on both coasts kept an eye out for the promising nobodies. A lot would depend not just on the up-and-coming actor’s talent, but those other indefinable qualities like charisma and personality. So it was no surprise that Warren Beatty, living in NYC, had almost every woman working in entertainment there wrapped around his little finger. Still, he was just stumbling along until talent spotter Eleanor Kilgallen decided to send him to Hollywood in 1959 to read for a Playhouse 90 part just perfect for him. When the production wouldn’t pay his way, Kilgallen, who was making one of her annual Academy Awards pilgramages to the West Coast, personally bought Beatty a coach ticket on the same plane she was flying first class. The next issue was finding Beatty somewhere to stay. Kilgallen always bunked at the Beverly Hills Hotel, and she decided to sneak Beatty into her hotel room. Complicating the situation was that Kilgallen was married, and happily, and her husband was already in Beverly Hills attending a convention. When Beatty arrived at the hotel with Kilgallen, he went into the bathroom, washed his only good white shirt, and hung it up to dry along with his pants and suit jacket. Then Beatty and Kilgallen left for a couple of hours. During their absence, Kilgallen’s husband came back to the room — to see a man’s clothes hanging in his wife’s hotel bathroom. “He was not pleased. Not at all,” Kilgallen recalled for me. When it became clear that Beatty would have to remain in Los Angeles for some time to go on auditions, Kilgallen decided to impose on Ina Bernstein, one of MCA’s West Coast women talent agents, who had a tiny one-bedroom apartment to herself on Doheny Drive. But Beatty didn’t know that Bernstein’s place was located right across the grass courtyard from her parents’ home, so close that the family members could practically stare into each other’s windows. When Bernstein dutifully told her dad that she was going to stash a young New York actor in her L.A. apartment with her, he posed only one question to his daughter about the arrangement. “Where’s the kid going to stay?” “On the couch,” she replied. Now, Bernstein was a nice Jewish girl. Single. And, of course, a virgin. And she knew Beatty’s reputation with women. So she was prepared when he tried to sleep with her. And try he did. Throughout his stay, Warren kept pounding on her bedroom door at all hours of the night, begging to be let into her bed. “Aw, come on, Ina,” he would say. “What’s the big deal?” (When he wasn’t chasing her, Beatty would sit in the middle of her living room obsessively polishing his shoes for hours.) Bernstein claimed to me she never succumbed to Beatty’s infamous charm. “But I struggled,” she admitted, laughing.